Lauretta and Sharon have just finished filming a taster for their London Irish pilot sitcom Concrete Heads after a hugely successful kick starter campaign. The sitcom follows a north London Irish family who run a family construction business. Concrete Heads- Sitcom taster from laurettagavin on Vimeo. Lauretta and Sharon Gavin have signed a development deal for their new sitcom with Miranda Hart & David Walliams’s production company, King Bert. Blended is loosely based on Lauretta and Sharon's unconventional home life and follows the daily challenges the sisters face in bringing up their kids living together as single parents. The Gavins have just started working with Warner Brothers developing funny videos on parenting and their lives as single mums living together for YouTube content. 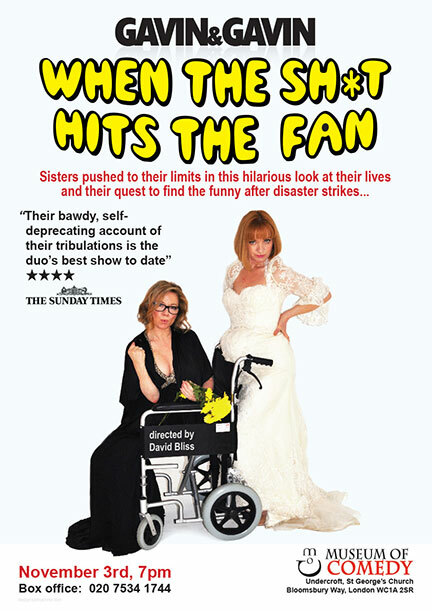 In 2013, the sisters took their show Darts Wives to the Edinburgh Fringe (Assembly) which sold out to huge critical acclaim, and was subsequently picked up by Channel X, to develop the show into a sitcom. Darts Wives from Justin Allder on Vimeo. The Gavin sisters have started a YouTube tube channel documenting Sharon trying to get off medication for her rare autoimmune disease through diet. A funny look into their world of being vegan, sober, single mums, living together with their two children. When The Sh*t Hits the Fan sold out to critical acclaim in Edinburgh. It comes to London for one night only. Please click here for tickets. The Gavins' Sitcom, Concrete Heads based on their family's construction business is in development with Channel X. They are also developing their sitcom Darts Wives with Channel X.
Darts Wives sold out to huge critical acclaim at the Edinburgh festival.